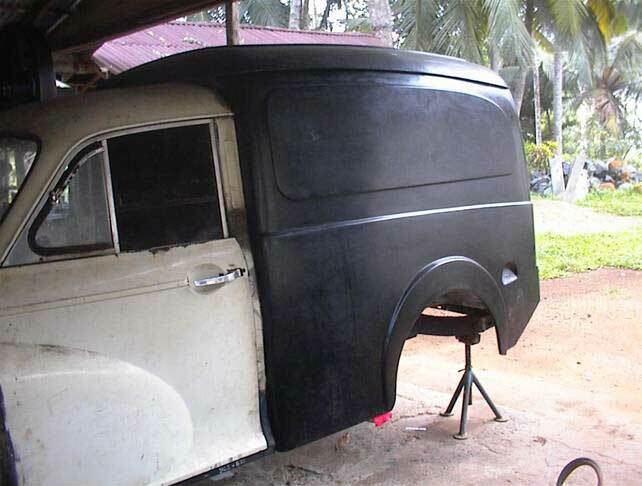 New Morris Minor Van - Nearly! Classic Cars, Sri Lanka is going from strength to strength. Several new projects are in progress. The picture shows the first of a series of Vans. 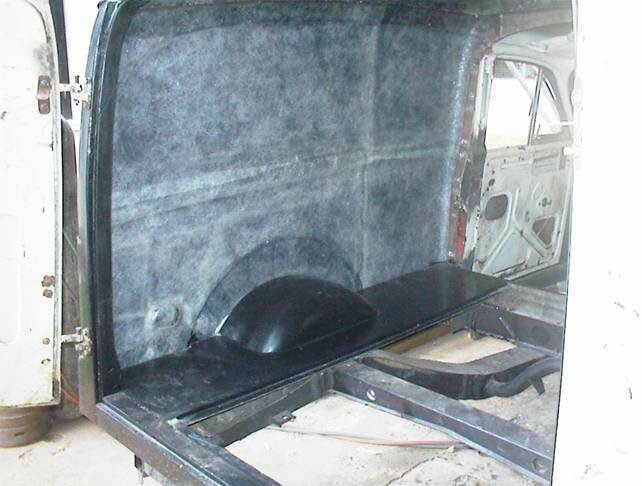 For some years we have been manufacturing the chassis frame and repair panels for Vans and Pick-ups. Now we have made the rear cabin entirely in fibre glass. There are no metal parts in the construction at all. The prototype looks very strong and will be tested as our company car. As a tough test, we plan to use it to carry heavy gas cylinders, 200 litre oil drums and other heavy goods on the rough roads of Sri Lanka. We will certainly soon know if it is as good as it looks. Morris Minor Vans are very rare in Sri Lanka and the Pick-up was never imported. To make these vehicles, we will have to use four-door saloons as donor cars. There are plenty of scrap cars we can use for the purpose and though these are very rusty, the parts of the cars we need will be usable. It is fairly easy to convert a four-door saloon to a driver’s cab for a van when we have taken off the front end and the floor pan. The B post is the same on a van and on a 4 door saloon. Apart from the mechanical parts, all we need from an old car is the front doors, the B posts and the roof with dashboard and front shock absorber cross member. The other parts we produce as new body repair panels. 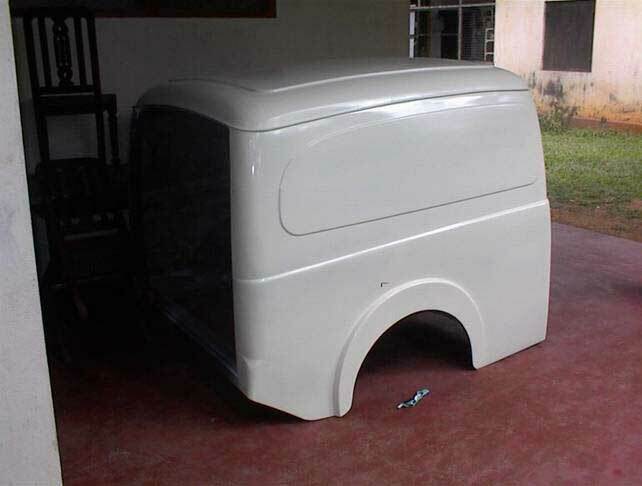 The quality of the finished bodywork will be very good. Initially, we will not be able to do a good paint job because it will be just what we can do in our garage ourselves. The leather seats, carpet, door liners and possibly the carpet and trim in the rear cabin will be high quality. The mechanical part of the job is a problem as only very few good parts are available for the purpose. Many parts can be renovated locally to a high standard. If something is not to the standard the owner wants, it is easy to change it later. Maybe we should only export the car without the mechanical parts? I do not yet know much about the price of the car and the shipping costs. These questions will have to wait until I have a car for myself imported to Denmark. It will be exciting to follow the development of this project. Smaller wheel arches giving better space in the cabin. Not many will observe that this is not the original cabin.